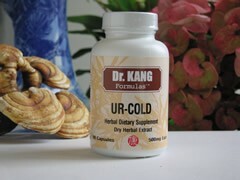 To be used as a supplement to a balanced diet when common cold and flu symptoms are present. Western medicine views common cold virus infections to be mild, self-limiting upper respiratory infections which resolve in several days. This assumes a healthy adult physiology and rest during the time of convalescence. In contrast to this, the common cold virus infections can be dangerous and compromising to young children and elderly adults. Flu virus infections can be more virulent and compromising to a broader spectrum of people. Traditional Chinese Medicine views cold and flu viral infections as a disease caused by exogenous Wind-Heat, an exterior pathogenic factor attacking human body surface. Signs and symptoms of cold/flu viral infections due to exogenous Wind-Heat included fever with or without sweating, chilly sensations, thirst, cough, drainage from sinuses and nose, headache, sore throat, achy joints. Tongue: tip is red color; tongue has thin white or yellowish coating on it. Pulse: is floating and rapid. This formula is not only for the first sign of cold and flu symptoms when colds and flus are easier to treat. This formula is also effective during later stages of a more entrenched infection. Infections tend to more from upper to lower respiratory tracts if untreated. If the infection has proceeded to the lower respiratory tract with coughing and chest pain, please use Dr. Kang Formula #2 - LR-Cough. This formula also can be used to prevent a cold when other family members are sick. Dr. Kang recommends keeping the air in the room fresh. Use vinegar in a humidifier as increased acidity is antiseptic for airborne bacteria and viruses.